Geoffrey Dutton on The Ham Funeral (Quoted by David Marr in Patrick White: A Life). 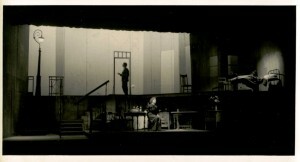 John Adams & Joan Bruce in the world premiere performance of The Ham Funeral, Union Hall, November 1961. Set by S. Ostoja-Kotowski. UAA Series 1477, Item 1. 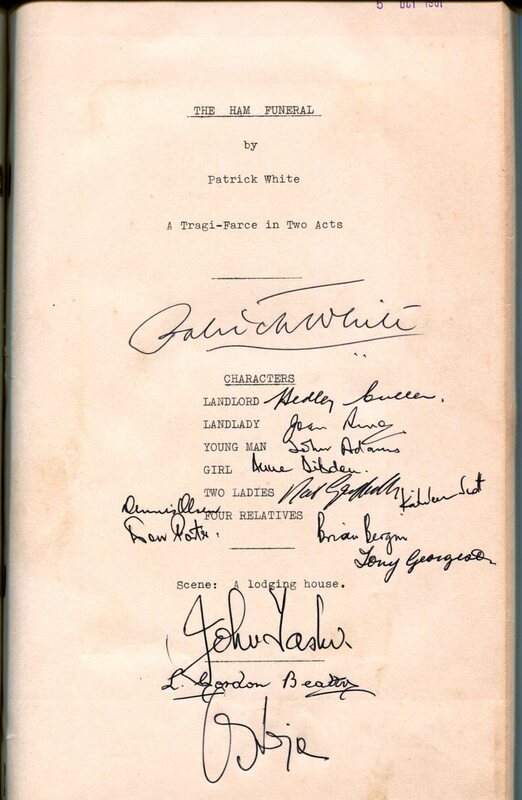 The University Archives recently received a remarkable donation related to University of Adelaide Theatre Guild’s world premiere productions of three Patrick White plays in the early-mid nineteen sixties. The records were collected by Beryl Sheasby (nee Pearce) who was the Theatre Guild’s secretary during the period of the performances of White’s The Ham Funeral (1961), The Season at Sarsaparilla (1962), and Night On Bald Mountain (1964). 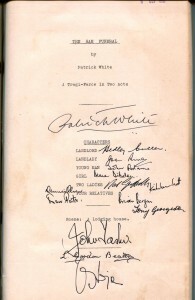 Included in the series is an original manuscript, publicity material, a number of fascinating photographs, and autographed actors’ copies of scripts. 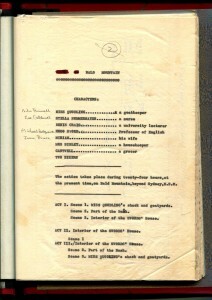 The Ham Funeral Script, signed by author, cast and director. UAA Series 1477, Item 3. Among Australians, the controversy over the play had dragged in many who were hardly interested in the theatre. The Ham Funeral had become a rallying point for those who were unhappy with the boring, official culture of Australia in the late 1950s and early 1960s, and hated the philistine power of the Establishment – the power, especially, to determine what was written and read in a country where books, films and plays continued to be censored and banned. By the time it opened in Adelaide on 15 November 1961, The Ham Funeral was an old play written, for the most part, in another country half a generation earlier, yet the fact of it being staged was like the waving of a banner of revolt. (Marr, 1991, p 394). 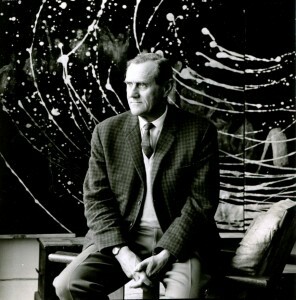 Patrick White publicity photograph by Axel Poignant. UAA Series 1477, Item 3. To be kicked in the arse for the third time by the philistine Adelaide Establishment is really a bit much. My first reaction was to want to call the whole thing off, but on thinking it over I have changed my mind. If you can put the play on during the Festival, as you say, we must make sure we hit the whole Festival sideways with the production of BALD MOUNTAIN. When we draw their audiences away, perhaps the powers will then realise. However, I must first be sure of certain details. I would only agree if the production takes place at the Union [Hall], because I feel the play needs such a stage and the best possible lighting. Other letters have White referring to ‘those bastards of the Establishment’ and ‘Australian puritans’. 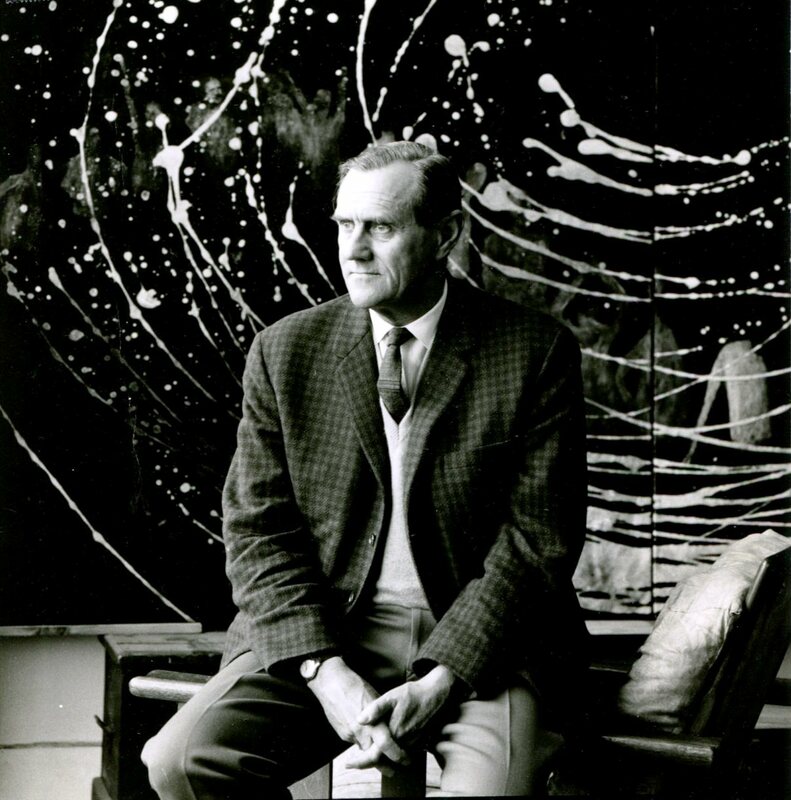 At this point such attitudes remained more or less confined to an artistic avant garde. Within a few years, however, they would become more mainstream with the emergence of a more open and permissive culture in the 1960s and 1970s. 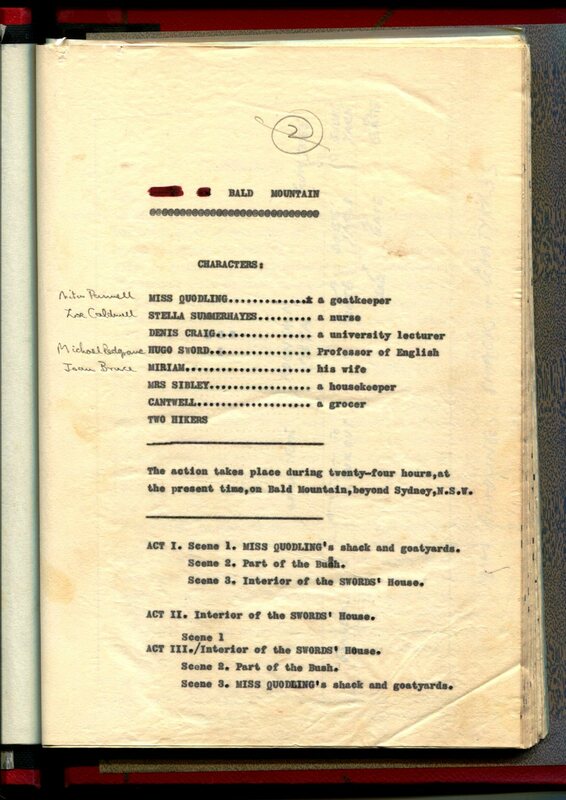 (Night On) Bald Mountain original manuscript. UAA Series 1477, Item 11. There is evidence here of both of these aspects of White’s character – the difficult, curmudgeonly side as well as that of the thoughtful gift giver. Several examples of the former can be found in his correspondence with the Guild, including some quite scathing remarks directed towards the young John Tasker. On the other hand there are examples of White’s generosity in signed copies of his then latest publication, Riders in the Chariot, and a book on Fashion sent to Beryl for the Christmas of 1962. The Season at Sarsparilla, signed program. UAA Series 1477, Item 7. A full listing of the holdings for this series can be found on the University of Adelaide Archives Guide. A further selection of images can be found in the document library here. Round, Kerrie. As Many Lives as a Cat? 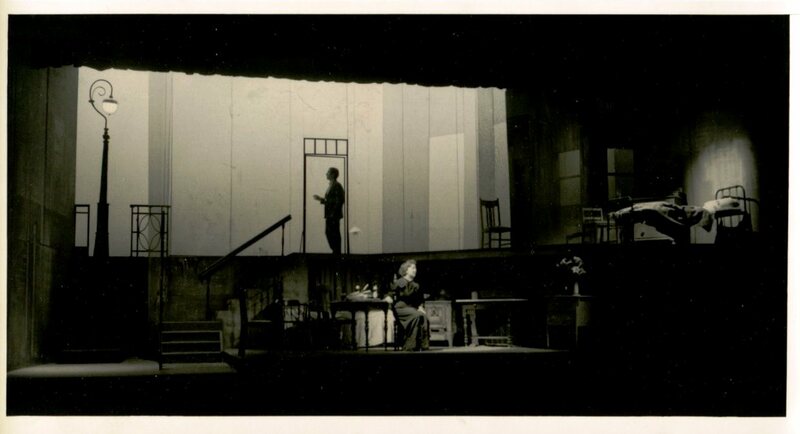 : The University of Adelaide Theatre Guild, 1938-1998. (Adelaide: U of A Theatre Guild, 1999). 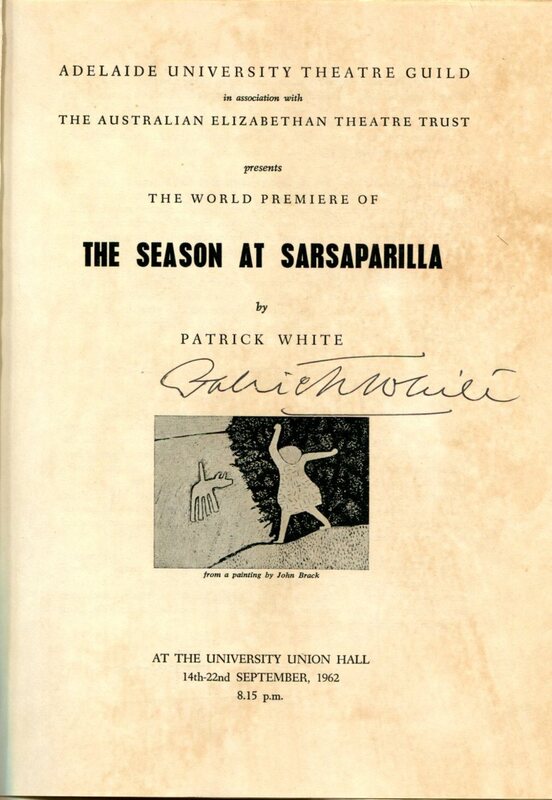 This entry was posted in Affiliated institutions, Ceremonies / celebrations, Community engagement, Student life / activism, Students / graduates and tagged Patrick White, Theatre Guild, Union Hall. Bookmark the permalink. Super interesting. University as hotbed of dissent in puritan Adelaide! Thank goodness for them eh?! I’m going to send this to someone who trod the boards of the Union Hall in the 60s, I’m sure he will be really interested. Thanks J! By all means pass it on – I think people have fond memories of this era as an exciting time in the development of a more mature Australian culture. Interesting Kippax comment – people really were excited by what appeared a great leap forward for the Australian theatre. And in Adelaide of all places! Andrew, thanks for highlighting this important addition to our collections. Well written and interesting. Very timely for me as I purchased a 2nd hand copy of White’s biography at a garage sale last weekend. I am enjoying ‘Archival Allsorts’.